Miami Dolphin 2014 First Round Pick at Nineteen.. 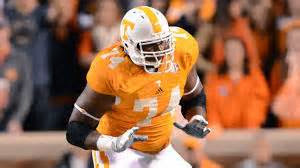 Consecutive 49 game SEC starter at Right Tackle for The Tennessee Volunteers, Ja'Wuan James. General Manager Dennis Hickey said that ""the Fins had several Trade Down from 19 offers, but felt too strongly about James to risk losing him for the offered compensation"". Traded down from 50 to 57 for additional 4th round selection, the Chargers #125. Traded down from 57 to 63 for additional 5th rounder, the Broncos pick #171 through SF trade. 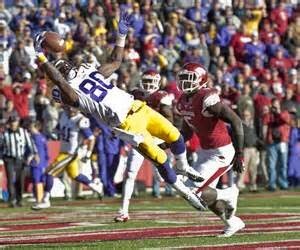 Miami Drafted SEC/LSU Receiver Jarvis Landry with that second round 63rd overall pick. Ex-NFL Defensive Back and current premiere NFL prospect analysts Mike Mayock said that Landry is one of his top ten favorite players. Mayock added that ""Jarvis Landry is absolutely the most physically tough Receiver in this draft class while being more than willing to go over the middle, and is a superior route runner with great hands that consistently makes the miraculous catch."" Miami Traded their own middle of the third round #81, and initial 4th round #116 picks to move up to the top of the 3rd rounds selection at #67. The Dolphins chose Billy Turner at pick 67. Turner started all 30 games (2012/13) at Left Tackle for the I-AA Missouri Valley Football Conferences consecutive three time national champion North Dakota State University Bisons. Because, one would think that they could have stayed with their own pick at 81, kept their own 4th rounder at 116, and STILL LANDED Billy Turner or Guard Gabe Jackson who actually went at 81 where Miami was to begin with. Because the Washington Redskins were on the clock and in the process of making their pick at #66 ! Simultaneously, The Dolphins were attempting to trade back up to #67 from 81 ! Once Miami got to pick 67 ! Washington at #66 coincidentally picked offensive tackle Morgan Moses who had played tackle at Virginia for three years under current Miami Offensive coordinator Bill Lazor! 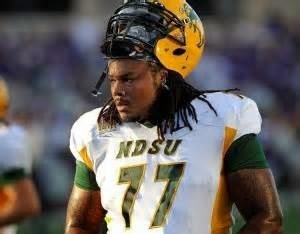 Dolphins picked small school tackle Billy Turner! Hmmmm?? Maybe they felt the need to have an additional OLineman that has extensive reps at Left Tackle? An absolute necessity! Maybe they were going after Moses to play Guard or backup Left tackle? What do you think, and how do you feel about The Miami Dolphins first three 2014 draft selections and maneuvers? Miami began the drafts final day with possession of five picks in the forth thru seventh Saturday rounds. Those picks included a forth round pick number 125. (Two in the fifth) at #155, 171, along with a third pick in thirty five selections at the sixth rounds #190 spot, and a seventh round selection at number 234. In the forth round at pick #125, The Dolphins selected Liberty Corner Back Walt Aikens who at 6-1, 205 happened to be the tallest, longest, biggest CB available at that point. According to NFL.com prospect analysts Nolan Nawrocki. Aikens strengths are ""Outstanding size. Good press strength. Good athletic ability. Can keep stride with receivers down the field and ride the hip pocket in man coverage. Aggressive tackler that led the team in tackles as a senior and is unafraid to mix it up. Takes on blocks with physicality and attacks the run. Adequate production on the ball. Has gunner experience."" With a second fifth round selection at #171 (accrued via second round trade down). The Dolphins chose Montana OLB/ILB and Team Captain Jordan Tripp. He is 6-3, 234 with twenty-two reps of 225 pounds, and runs a 4.67 forty. Prospect analyst Nolan Nawrocki; ""Diagnoses quickly and is around the ball a lot. Outstanding motor, intensity and effort. Extremely competitive. Very tough. Outstanding weight-room work ethic. Exceptional character. Emergency long snapper (started all four years at line backer). Has a special-teams temperament. Takes the game very seriously. Athleticism was on display at the combine, paced linebackers with a 3.96-second short shuttle, recorded a 6.89 second 3-cone drill and vertical jumped 37 1/2 inches. A tough, determined, competitive overachiever""
What are your thoughts on THE MIAMI DOLPHINS 2014 DRAFT?